Excellent and mature desktop GIS software should be equipped with various kinds of features to meet the needs of all potential users, and SuperGIS Desktop 10 is definitely one of the most outstanding products that you can find. First of all, SuperGIS Desktop 10 takes pride in its complete GIS functionality. Its built-in toolkit includes almost all kinds of functions you may need when processing spatial data. Users can freely pick the ones in need according to their projects and achieve various goals with ease. 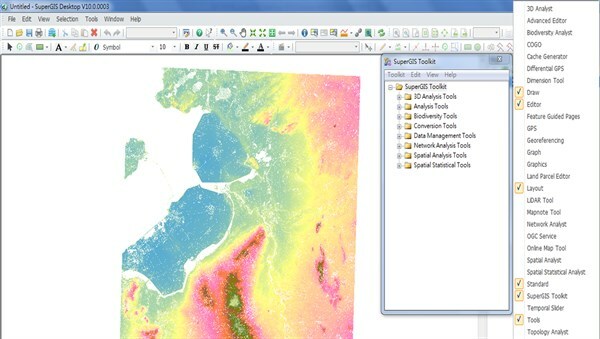 Secondly, SuperGIS Desktop 10 provides many toolsets for specific tasks, which are called as “add-ons.” Users are able to decide whether these particular set of tools (for example, Land Parcel Editor for editing cadastral data, and LiDAR Tool for processing LiDAR data) should be activated or not. Only the required toolsets will be shown on the screen, while others can be hidden. Furthermore, users can drag and drop the toolsets to any working areas or even dock to the frame based on the preference, making the interface more clear and intuitive. When we use the abbreviation “GIS,” it generally stands for “Geographic Information System” or “Geographic Information Science.” No matter which one you use, GIS is either a powerful tool or analytical method that can be applied in various fields. It helps us display, recognize, and analyze geographic features and then utilize them to discover spatially related patterns. 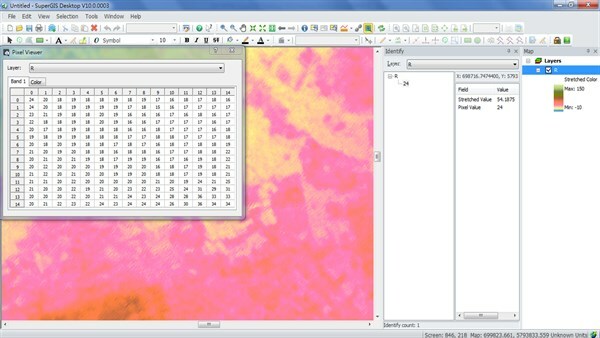 Take raster data processing for example, which is commonly used for analyzing vegetation growth or surface changes. When using SuperGIS Desktop 10 to load raster data, we can open a window of Pixel Viewer to show the value of any specified target cells as well as its adjacent pixels, as shown in Fig. 2. At the same time, we can activate “identify” function to check more information like coordinates and stretched value. These two designs make users check rich information at once possible. Also, SuperGIS Desktop 10 performs perfectly in spatial data displaying. For example, in Fig. 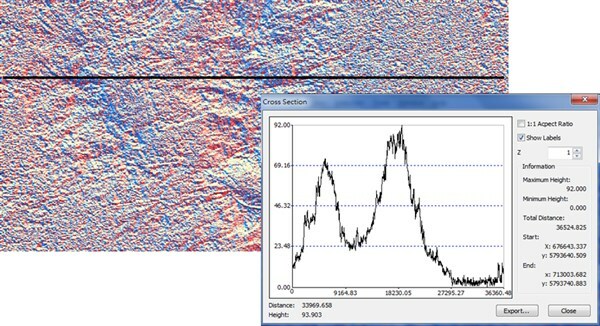 3, to analyze a DEM dataset, we can apply the cross-section function in Spatial Analyst to view elevation profile. Combining that with Aspect Mapping, we are able to understand the overall topographic characteristics of any study areas. For engineering consultants, they can estimate the costs of a construction project as well as improve the building design. 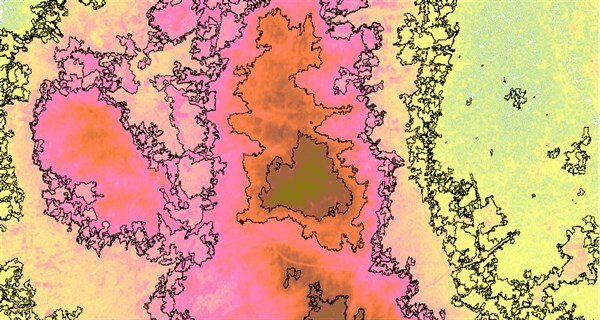 Another common function in GIS software is contour mapping. As shown in Fig. 4, in SuperGIS Desktop 10, users can specify a particular area they want to draw contour lines by mouse. Thus, we can easily understand the landform only within the area we have interests. There is no need to process the whole DEM data like some other software does, saving a lot of time. Current GIS projects can be complicated and vary greatly in different domains. Therefore, it is very important to pick powerful and professional GIS software that can really meet your demand and finish the project smoothly. SuperGIS Desktop 10 has not only excellent GIS features inherited from SuperGIS Desktop 3 but also many brand-new functions. Also, when you have advanced GIS needs, SuperGIS Desktop 10 provides the tool for customization in Python language, enabling you to create an exclusive workflow. Furthermore, as we know, a good product always has a strong support team as its backbone. The technical support team of Supergeo is ready to help our users solve any problems encountered with the highest service quality and shortest time. Last but not least, SuperGIS Desktop 10 supports more than ten languages, making users from all over the world access effortlessly. 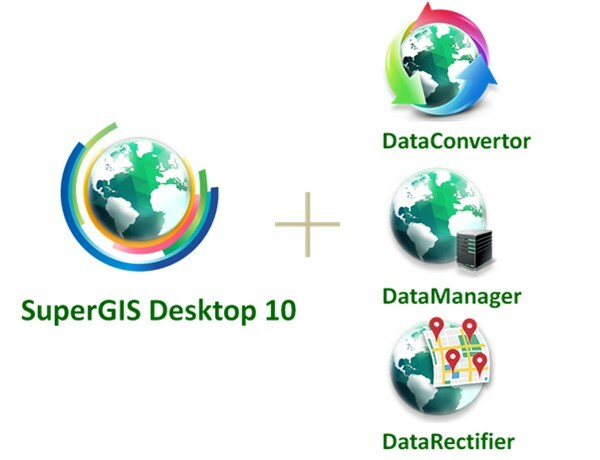 What’s even better is that there are three additional programs attached to SuperGIS Desktop 10 for further uses; Data Manager, Data Convertor and Data Rectifier can help users convert data formats, manage metadata and change coordinate systems without even running the main program. With so many amazing and useful functions as well as a high cost-performance ratio, SuperGIS Desktop 10 is undoubtedly one of the best choices for your GIS project!